-10 J Kokrak (US); -9 C Reavie (US); -8 D Johnson (US), T Merritt (US), B Watson (US); -7 M Leishman (Aus). Selected others:-6 R McIlroy (NI), A Scott (Aus); -5 J Rose (Eng); -4 M Laird (Sco); -2 L Donald (Eng); -1 J Donaldson (Wal), P Harrington (Ire); +5 J Spieth (US). Rory McIlroy remains in contention at the Northern Trust Open as world number one Jordan Spieth missed the cut. 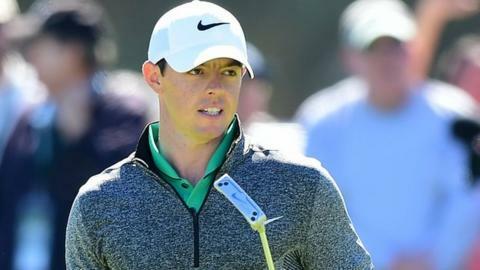 McIlroy shot a second round 69 to lie six under - four behind leader Jason Kokrak - in California. Kokrak, who is seeking his first PGA Tour win, followed his opening round of 68 with a 64 and is one clear of compatriot Chez Reavie. Spieth followed his eight over opening round of 79 with a 68 but still missed the cut by five shots. It was the 22-year-old Texan's first missed cut since last year's Deutsche Bank Championship in Boston. "I will be ready to go in the next tournament. I am not going to let this one get to me very much," he said. "We rebounded in perfect form last year on just about every missed cut. We'll be fine." McIlroy started quickly with birdies on two of his first three holes and narrowly missed an eagle chance at the 17th. "I just need to get off to a fast start tomorrow [Saturday], get myself close to the leaders and play a good, solid round and see where that puts me going into Sunday," he said.